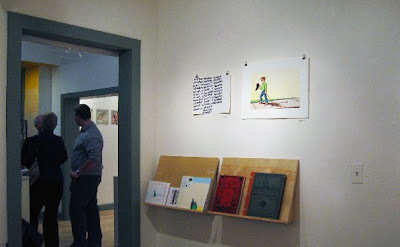 News of the show I curated from the AS220 Flatfiles. with some quick and dirty photographs. For info about purchasing these works from the comfort of your computer click here. 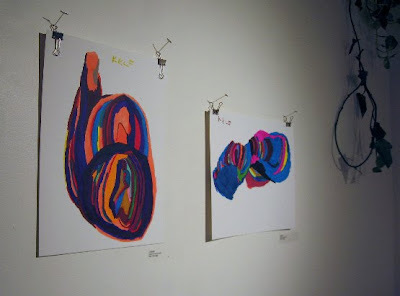 The prompt for this small exhibition was the mysterious reappearance after five years of a group of my own small works. 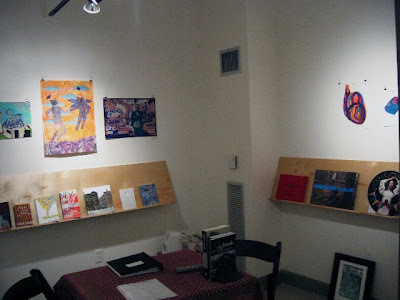 I lent the works to a nonprofit for a benefit in 2003, maybe 2004. Between my own distraction with leaving Providence, for what I thought was going to be forever, and personnel turnover at the sponsoring organization, the drawings became forgotten. Earlier this year, during the most mundane of tasks, dropping off small farm eggs to the local buying co-op, I was startled to see my pieces pristinely leaning against the back wall of the drop off spot. The lost works were made just after the turn of the millennium and explore dark apocalyptical imagery. With hindsight I can say that they reflect the conflict and confusion of the first leg of my time in Providence drawing to a close, though if you had asked at the time I would have sworn they were about America's foreign policies'. When I dropped off the lost works for the AS220 flatfiles, Gallery Director Neal Walsh asked me to curate a small selection of works from the flat files. Discovering the lost works I felt the same calm excitement I've felt finding a beautiful unexpected work while digging through the flatfiles at Perogi or at The Boston Drawing Project. Therefore my selection of works from the flatfiles collectively contain the same sense of weathered urgency I now see in my lost works. What they share is a forthrightness. These works are not shy. I was delighted to find the work of the seemingly endlessly talented Top Drawer Artists' of Warren, RI available through the AS220 Flatfiles. AS220's open door policy is an asset to Rhode Island artists off all stripes, I hope more artists are encouraged to submit their works on paper to the flatfiles. David "DJ" Jebutu and Daved Ferrell's work fell in together early in the process. DJ's deceptively simple drawing Adventure, where the word adventure printed boldly and repeatedly seems to marching towards adventure with a firm resolve. DJ's adventure is fully anticipated but not yet entirely experienced. When I paired Adventure with Ferrell's Loss and Remorse, they created a classic tragic narrative of adventure ending with taciturn regret. Anthony Pontarelli, Meredith Stern, and Tony Carneiro's work taken as a triptych speaks of desire, half forgotten dreamscapes, fragile relationships, and a square urban jawline, all working parts of Rhode Island's social terrain. I was especially struck by Kyle Komeiga's abilty to transform the humble medium of makers into scrunchy ebullient odes. His drawings create such distinct shapes without firm descriptive edges. 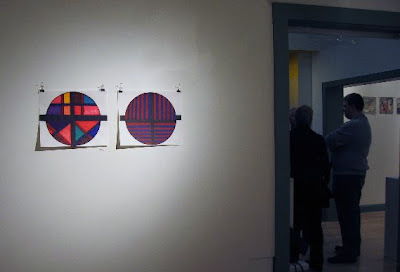 Brian Lamora's Circles end the circumnavigation of the room, with his mandala-esque homages to geometry and color. His circles remind me of all of the contradictions of circles, they imply both journeys and stasis. The Circles also slyly solve the "color" paradoxes posed in the early works of Jasper Johns. Like the circle, and my lost works, we end up where we started but we seem to be in a different place altogether.